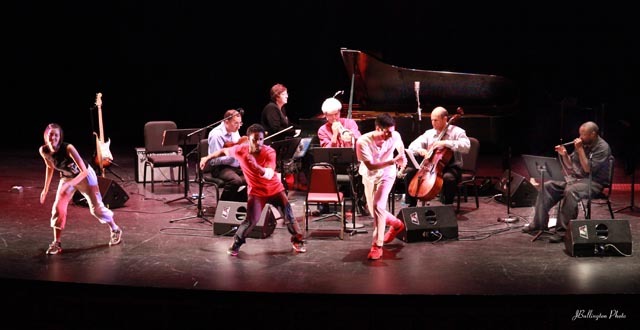 When one combines a classical chamber music trio, a human beat box artist, hip hop dancers, and four soloists performing new music by five composers writing in cross-genre styles, the result can be nothing short of an eclectic and electric performance! Underwritten by the Bruce Carver Multi-Cultural Fund this creative collaboration features the renowned Kandinsky Trio and beat box phenomenon, Shodekeh with guitarist Cyrus Pace, soprano Nancy McDuffie, trumpeter John D’earth, and trombonist Jay Crone. Dancing throughout will be hip-hop artists, The Boogaloo Crew. The composers are John D’earth, James Miley, Dan Cavanagh, Sherisse Rogers, and Brian Coughlin. The Kandinsky Trio, in residence at Roanoke College, is known throughout the world of classical chamber music for both their passionate performances of masterworks and their innovative ideas for re-defining the genre. The Trio performs throughout the country in prestigious venues like New York’s Miller Theater and Merkin Hall, Atlanta’s Spivey Hall, Washington’s Kennedy Center, the Interlochen Festival, and Cincinnati’s Arnoff Center. In 2002, the Trio was in residence at the European/American Masterclasses at the Hindemith Center in Blonay, Switzerland and continues its annual residency at the Society of the Four Arts in Palm Beach, FL. The Kandinsky Trio is one of only six piano trios ever to win the prestigious Chamber Music America Residency Award. Shodekeh, a self-taught vocal percussionist, learned his art from hip-hop but enthusiastically enjoys switching gears to perform unexpected genre like ballet with Towson University’s dance classes, musical interpretations of gallery exhibits at the American Visionary Art Museum, and jazz at the 60th Annual Conference on World Affairs at the University of Colorado at Boulder.Guitarist Cyrus Pace played his first professional gig at fifteen, toured extensively with the Navy Band, and received his Master’s Degree in Jazz Performance from the Manhattan School of Music. He teaches and plays throughout Virginia and is guitarist for Le Hotclub de Biglick, which was named to the Virginia Commission for the Arts for 2009-2010. A native of Roanoke, VA, soprano Nancy McDuffie has been on vocal studies faculty at Virginia Tech for fifteen years and holds a Masters Degree in Vocal Performance from the State University of New York at Fredonia. She enjoys a variety of musical styles and particularly excels at 20th century vocal works. In 2003, she premiered a commissioned set of songs by Jon Polifrone of poetry by contemporary singer and entertainer, Jewel. Jay Crone, Associate Professor and head of the Virginia Tech Department of Music, is in his fourteenth year as professor of low brass. Crone received degrees from the University of Southern California, Yale University, and California State University at Fresno. Crone was the assistant director of Virginia Tech’s Marching Virginians for ten years. He has performed on trombone and euphonium with many symphony orchestras and bands throughout the United States, including the Fresno Philharmonic, the Roanoke Symphony Orchestra, Opera Roanoke, the Wintergreen Performing Arts Festival, and the Shenandoah Valley Bach Festival.The Boogaloo Crew is a newly formed, local group of professionally trained dancers including William Robinson and Jacob Esocoff. Robinson is a recent graduate of the University of the Arts (UArts) with a B.F.A. in Modern Dance Performance and has performed at the Lincoln Center, the Kennedy Center, and the Annenburg Theatre. Esocoff has also studied dance at UArts and has been involved with movement through Tae Kwon-Do since the age of six, achieving his black belt at 16. John D’earth, composer, trumpet player, jazz musician and arranger, began playing music professionally at age fourteen and by sixteen Downbeat magazine said, “The sixteen year-old D’earth sounds like a young Freddie Hubbard.” D’earth has appeared on over 40 recordings and film scores and has performed around the world. He has performed with or written music for such artists as Buddy Rich, Bruce Hornsby, Miles Davis/Quincy Jones, Mel Torme, and Lionel Hampton. He wrote the string arrangements for the Kronos String Quartet’s appearance on Halloween and The Stone titles from the recent Dave Matthews Band CD, Before These Crowded Streets. D’earth teaches in the jazz program at the University of Virginia and performs regularly with his band, Thompson D’earth Band, on Thursday nights at Miller’s in Charlottesville. James Miley—recipient of the Gil Evans Fellowship in Jazz Composition—is the Director of Jazz Studies at Willamette University in Salem, Oregon, following a five year appointment in the department of music at Virginia Tech. A composer and improvising pianist comfortable in both the jazz and classical idioms, he has written music for a variety of chamber and choral ensembles in addition to his work for jazz orchestra. In 2006 he made his Carnegie Hall debut as a composer with “After the Water, the Clouds,” premiered by the James Logan Wind Symphony under the direction of Ramiro Barrera. He has appeared as a guest composer and director at numerous festivals and universities, including the University of Kansas, University of Idaho, University of Michigan, University of Nevada, University of Oregon, CSU Northridge and the Monterey and Reno Jazz Festivals. Miley’s music can be heard on the critically-acclaimed Origin Records releases “The GADfly” by the chamber jazz ensemble BUG with saxophonist Peter Epstein and “Confronting Inertia” by trumpeter John Adler and pianist Tracy Cowden. His catalog of published compositions and arrangements is available through Walrus Music and UNC Jazz Press. Pianist and composer Dan Cavanagh has garnered numerous awards for his compositions including a First Music Commission from the New York Youth Symphony Jazz Band Classic and Finalist in the 2002 and 2005 American Society of Composers, Authors and Publishers’ Young Jazz Composers Competitions. His music has been performed at Lincoln Center, the Reno International Jazz Festival, and the 2006 International Jazz Composer’s Symposium, to name a few. Cavanagh is an Assistant Professor of Music and the Assistant Director of Jazz Studies at the University of Texas, Arlington. Sherisse Rogers is a prize-winning composer, arranger, and orchestrator whose most recent award is the 2008 Thelonius Monk Institute’s Best Composition award. A versatile composer, her styles range from jazz and classical to world music and Rhythm & Blues. She is a regular arranger and orchestrator for the world-renowned crossover orchestra “The Metropole Orchestra” based in the Netherlands. She was a featured composer and clinician in Stockholm, Sweden at the Royal Conservatory of Music. In 2007, she was also the featured artist at the Jazz Cologne 07 jazz festival where her compositions were performed with the Cologne Contemporary Jazz Orchestra.